(From company literature) Pentax Rear Converters allow 1.4X (w/ 1.4X-S or 1.4X-L) or 2X (w/ 2X-S or 2X-L) increase of the focal length and f-number of the lens in use when this converter is mounted between the lens and the camera body. 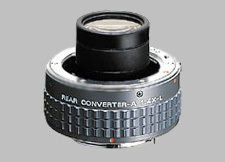 These converters have lens information contacts, which enabled all AE programs on Pentax KA- or KAF- mount cameras to operate with Pentax compatible lenses. When combined with Pentax K- mount camera and compatible lens, open aperture metering and automatic aperture are coupled. The Pentax 1.4X-L doesn't have any user reviews yet!